Having been invited across to Swindon for the Bailey of Bristol 4th generation Unicorn launch we are heading on a mixture of motorway and countryside roads. I silently curse myself as the sky gets greyer and greyer the nearer we get. Entering into the beautiful, Cotswold stone hotel we are pointed in the direction of the rooms hosting the launch. Passing the ladies and gents, it must be our age, as we decide to pay a visit, you never know when your next chance will be! Into the launch meeting area and familiar faces of other bloggers meet us. The reason we are here today, caravans, brand new caravans stand just beyond the window as the wind tries its best to bring the rain in. Pleasantries done, formal introduction to the day, a presentation of how those beasts outside evolved and we are freed from the confines of this hotel into the distinctly cooler air and out towards the caravans. 8 out of the 10 new caravans in this new range stand proudly before us. Two of the ten designs are still to be confirmed. On gravel, high heels gratefully abandoned behind a plant pot, I ease my feet into my flip flops. Comfort at last. The caravans are being scrutinised by others also here from the launch, Bailey UK owners club, a caravan cooking celeb, journalists, bloggers and vloggers, a few others and a plethora of Bailey staff. 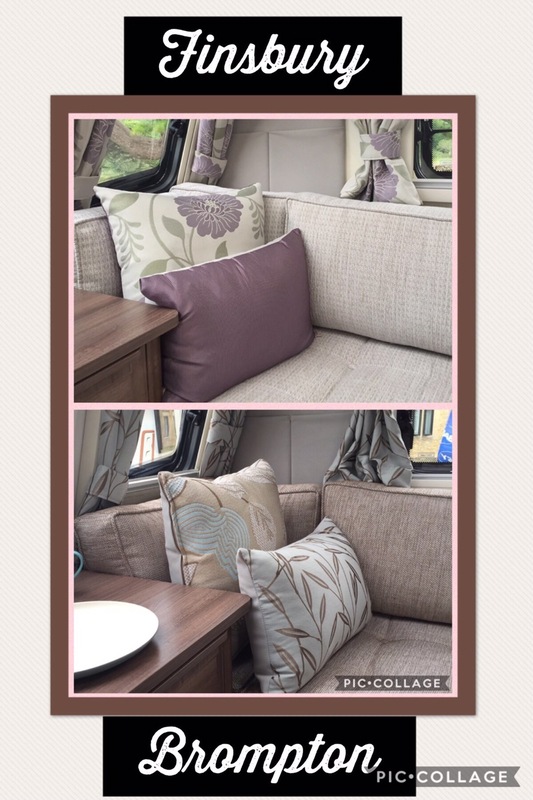 I want the caravans to myself, I want the chance to feel the fabrics, squish the cushions, lift the seats, open the drawers and contemplate the bathrooms. 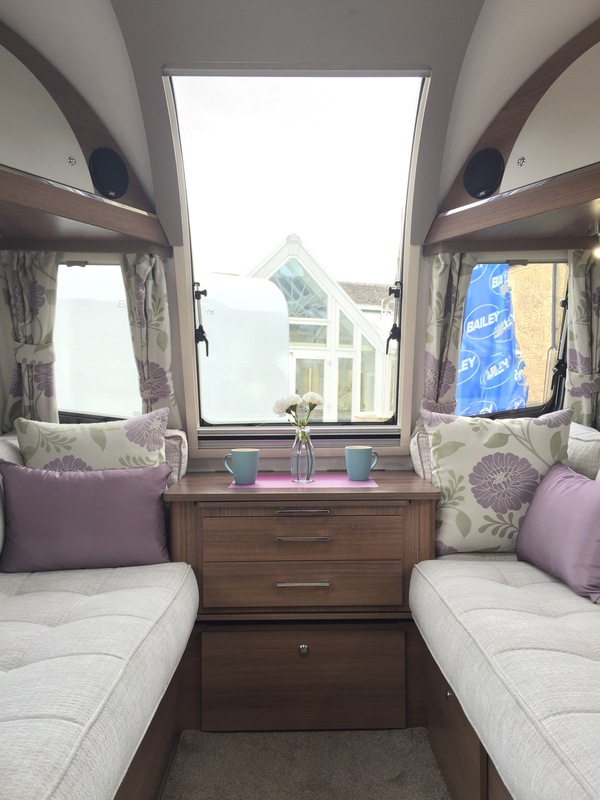 With a choice of two designs the upholstery is quite light and airy. The standard design is the Brompton with the Finsbury as an option. Destined to be shrouded with throws by families and dog owners alike, to preserve the beauty of the fabric, a fabric that needs to be seen. The bulkhead has been removed which means that the seats are up to 5% longer (model specific) and more suited to day lounging or for the option of using as single beds. Personally I like a window ledge and wasn’t comfortable sitting so close to the window and the curtains. We did manage to sit 6 adults relatively comfortably in the Cabrera, so would be great for entertaining. The seating areas in all of the ‘vans felt spacious and comfortable. Surprisingly so, the two berth Seville. Which was very reminiscent of our Orion 400-2. Small and compact on the outside and very Tardis like on the inside. 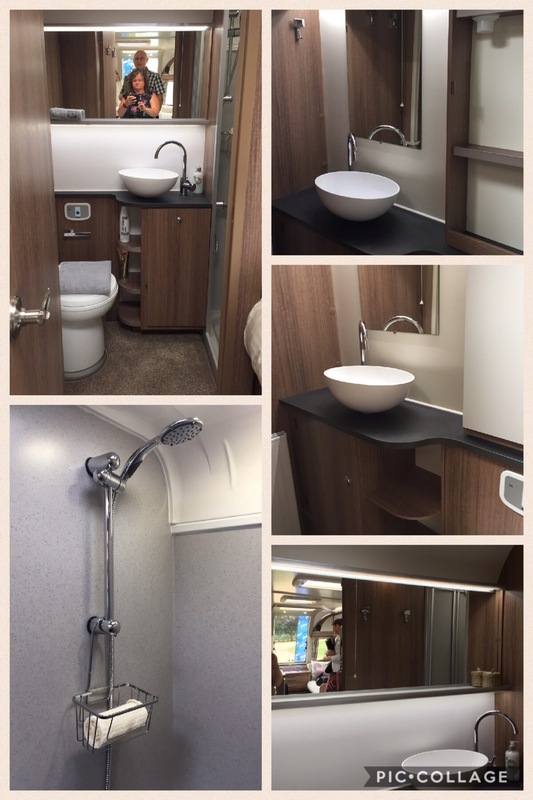 With a side bathroom and an end kitchen this is an interior quite different to other caravans. This would’ve been my choice of purchase on the day, it’s only downside, having to make the bed up. 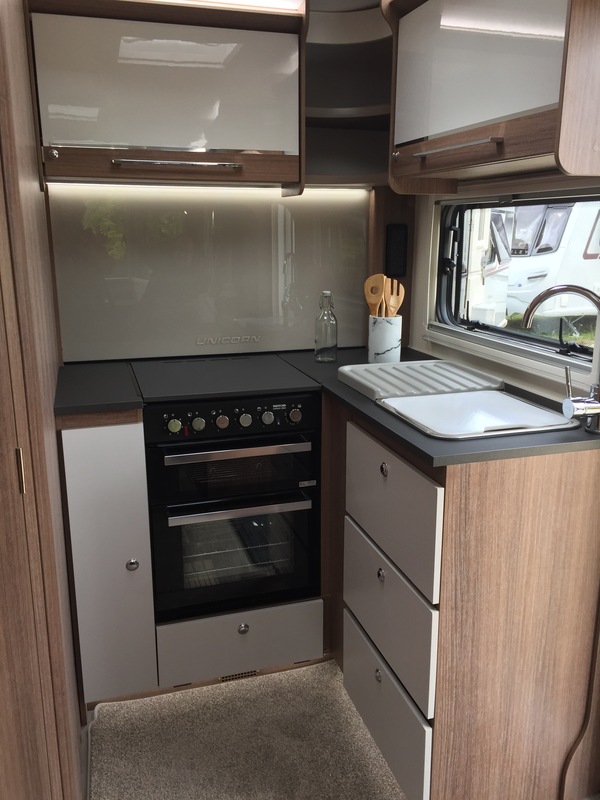 The kitchens in the other caravans are more or less standard. A couple of modifications are evident in this new range of Unicorn. They have added a drop down hob cover creating extra workspace throughout the range. This I did like. The hob fits slightly left of the end of the worktop. Meaning you can use pans on all four burners. 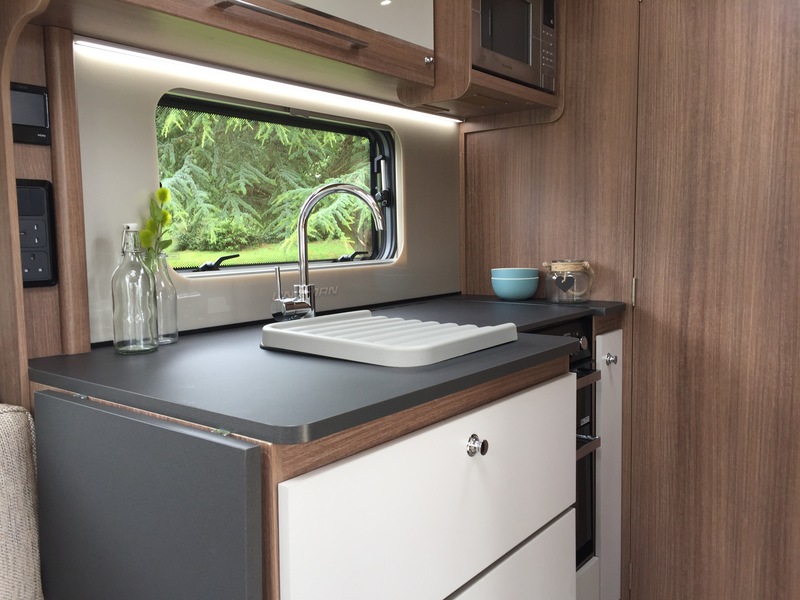 An extendable worktop creates even more worktop area. With three extremely spacious and soft touch drawers beneath the sink, storage has been well thought out in the kitchen area. 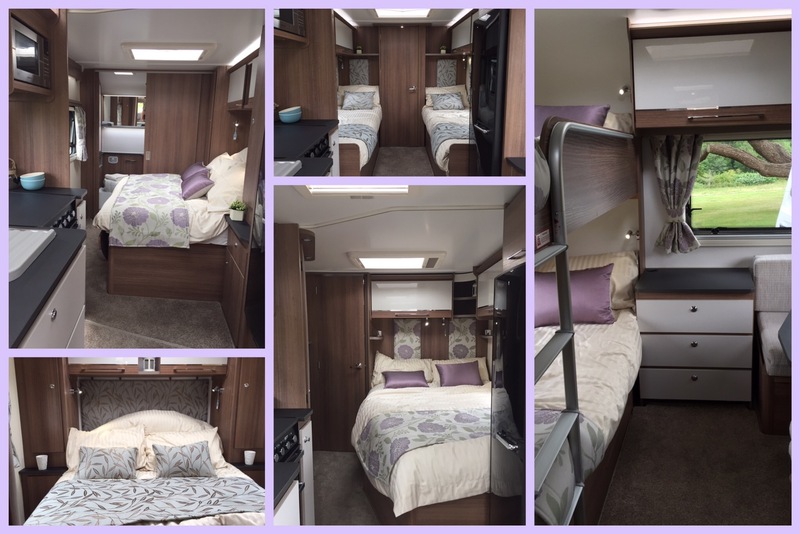 With a variety of bedroom layouts and beds there is something to suit everyone. The beds are typically longer than previous models, suited to the taller person. No more feet hanging off the end. From families to make your own bed up. A couple of them even had a lovely window at the foot of the bed, perfect for that secluded site with a perfect view. Bathrooms, I loved all the bathrooms. It felt like storage had been really well thought out with shelving and cupboards. With fully lined single piece showers throughout the range. The end bathrooms lacked windows but I did like the extra long back lit mirror that sat behind the boutique style sinks. Baskets for toiletries in the spacious showers, also an added bonus that mine doesn’t have. No more scrabbling on the floor for shampoo. In the centre bathrooms the shower sits above a wheel creating a ledge within the shower. Perfect for the ladies for popping your foot on whilst shaving your legs. Good blog. Personally I would still like the washroom to have a window, but if I liked the rest of the van I could live with it. Like you I also prefer to not have to make the bed up. The Valencia would still be our van of choice. Didn’t like the the way the transverse bed made-up. Hopefully will see them to have a nose around.